On Sunday, the urban75 forums notched up their 11 millionth post, a pretty incredible landmark for a non-profit, self-funded bulletin board that carries no advertising. 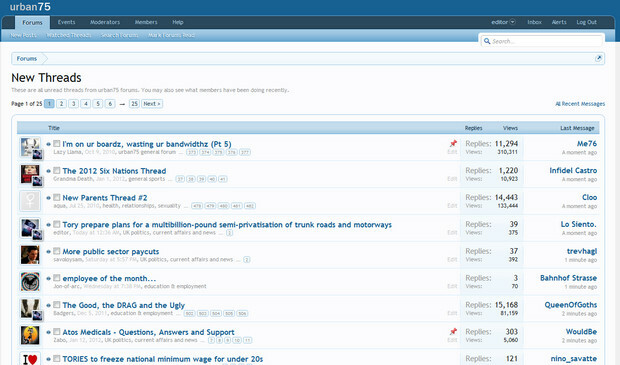 The first version of the Brixton-based boards started up in 1996 as a no-frills, Perl/CGI-powered forum that was swiftly withdrawn after being filled up by nutty Internet people. Successive versions of the boards have offered more sophistication and admin controls, and after several years using the vBulletin software, we moved to the excellent XenForo software in August 2011, becoming their biggest UK installation. 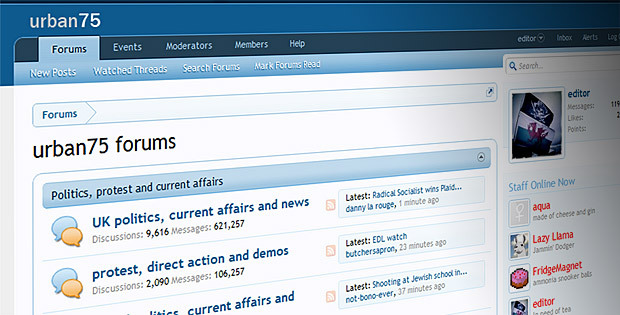 The boards now boasts over 41,000 registered users and covers a huge range of topics, with over 30 themed forums covering subjects from politics, protest, football, music, film, local issues, transport to knitting and cooking. Entirely funded by users who donate anonymously (and thus get no added privileges), the urban75 community has proved to be a truly wonderful thing, with the site spawning many marriages, births and long-term friendships! I count many of the urban75 community amongst my very best friends, so it’s great to see the site still going strong and still offering a non-corporate, non commercial alternative to the likes of data-mining companies like Facebook. urban75 users: I salute you!